Airmax SW40 System, 400' 3/8" EasySet Airline | Fountain City Art Ctr. Airmax Shallow Water Series Aeration, SW40 115V System, 400' 3/8" Weighted Airline. 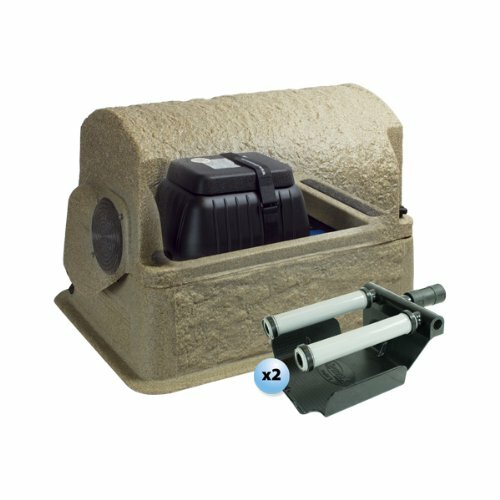 Airmax SW40 Aeration Systems are the top choice for pond owners everywhere to efficiently and effectively deliver much needed oxygen and circulation into the water. Aeration creates a healthy ecosystem resulting in improved water clarity and fish health. Perfect for shallow ponds, beach areas or waterfront properties. Protects fish against oxygen loss in the winter and reduce mucky pond bottoms. The SW40 Shallow Water Series System aerates up to 1/2 acre, up to 6' deep max. The composite cabinet with built-in rain guard, 6' power cord, air filter protects the whisper-quiet SilentAir LR50 Diaphragm Compressor. SW40 produces 4.9 Max CFM with 1.1 running amps. 2-Year Warranty. Includes (4) ProAir 2 Diffuser Plates and 400' 3/8" Weighted Airline.